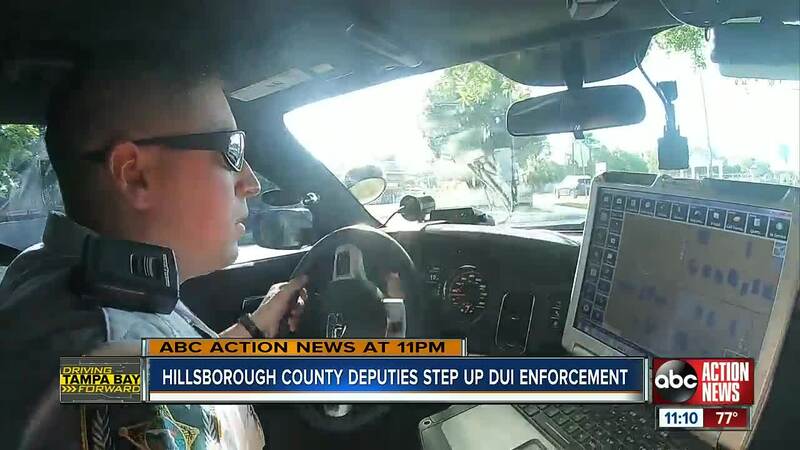 TAMPA, Fla. -- The Hillsborough County Sheriff's Office created a new DUI Enforcement Squad to catch impaired drivers in the county. The squad will consist of 20 deputies and two supervisors specially trained to detect and apprehend impaired and intoxicated drivers. "The advantage of having all the deputies under one chain of command, they get the latest training, the latest case law update, the latest equipment," said Major Darrin Barlow with the Hillsborough County Sheriff's Office. On Friday night, the Hillsborough County Sheriff's Office, Tampa Police and Florida Highway Patrol ran a joint DUI operation. "We have zero tolerance for reckless individuals who choose to drive while impaired," said Sheriff Chad Chronister. Deputy Jordan Brizendine showed ABC Action News how the newly-formed DUI Enforcement squad will work. Deputies will focus on catching impaired drivers and traffic enforcement. "We look for a lot of swerving within the individual lane. You'll also see people drifting off the side," said Deputy Brizendine. "There is actually a lot of impaired drivers that drive up and down Dale Mabry Highway, You have the stadium right there and a lot of people coming from Amalie Arena," he added. On Friday night, deputies looked for impaired drivers including on FL-60 and I-4. In 2018, Hillsborough County arrested 1,631 impaired drivers. These were drivers under the influence of alcohol or drugs. In 2017, deputies arrested 1,738 people. "Tragically right now, Hillsborough County is ranked number one in the state for DUI injury accidents," said Major Barlow. "By launching a new DUI Enforcement Squad, we hope to not only create safer roadways, but also use these deputies to educate the community. Part of their role will include instructing businesses on how to be responsible vendors and holding workshops at area high schools to teach young people the importance of driving sober," said Sheriff Chronister.